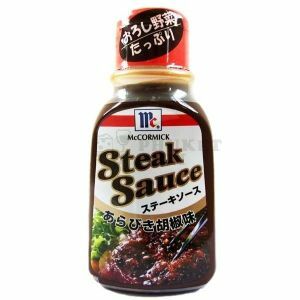 Steak sauce is normally brown or orange in color and often made from tomatoes, spices, vinegar, and raisins and sometimes anchovies. The taste is either tart or sweet with a peppery taste similar to Worcestershire sauce. The brand A1 Steak Sauce is a tart variant. There are also numerous regional brands that feature a variety of flavor profiles. Along with A1 and Lea & Perrins, several smaller companies and specialty producers manufacture steak sauce, and most major grocery store chains offer private-label brands. Heinz 57 is a steak sauce produced by H. J. Heinz Company which, unlike other steak sauces, has a distinctive dark orange-yellow color and tastes more like ketchup spiced with mustard seed.